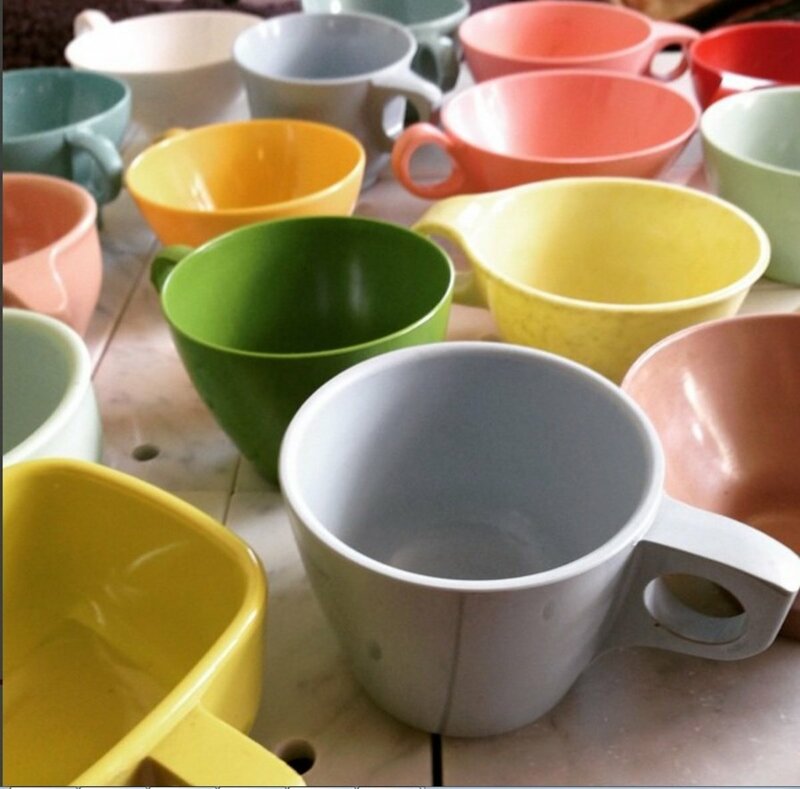 A simple collection can beautify and personalize your home. It does not have to be expensive, as long as it is something you love. 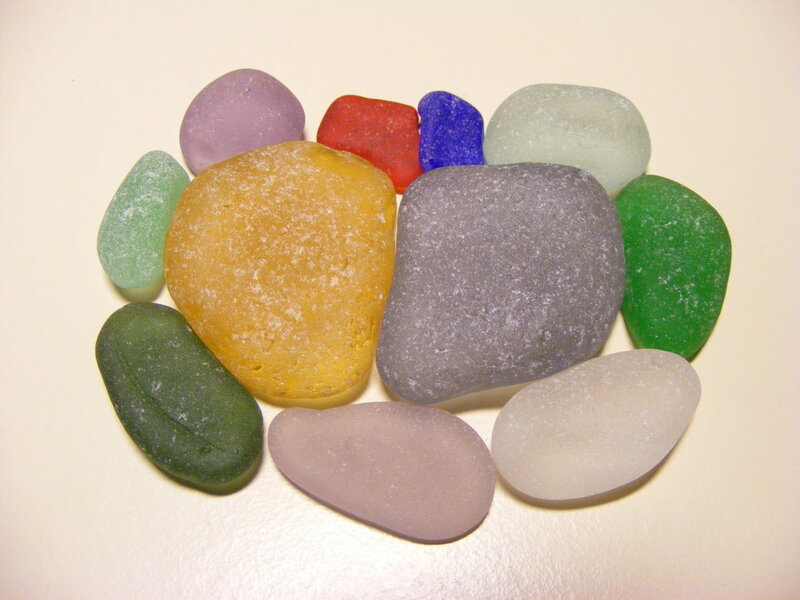 Prior to 1880, in order to make two-color glass, colored glass had to be layered or "flashed" over clear glass. This was achieved by dipping the clear one into a molten colored glass, and then patterns were cut into it by hand. This type of glass was labor intensive to make and expensive to own. In 1888, Henry Mueller patented a process of applying a chemical stain to the raised surfaces of pattern glass. This is what made ruby-stained pattern glass possible. It mimicked the more expensive ruby-flashed variety. 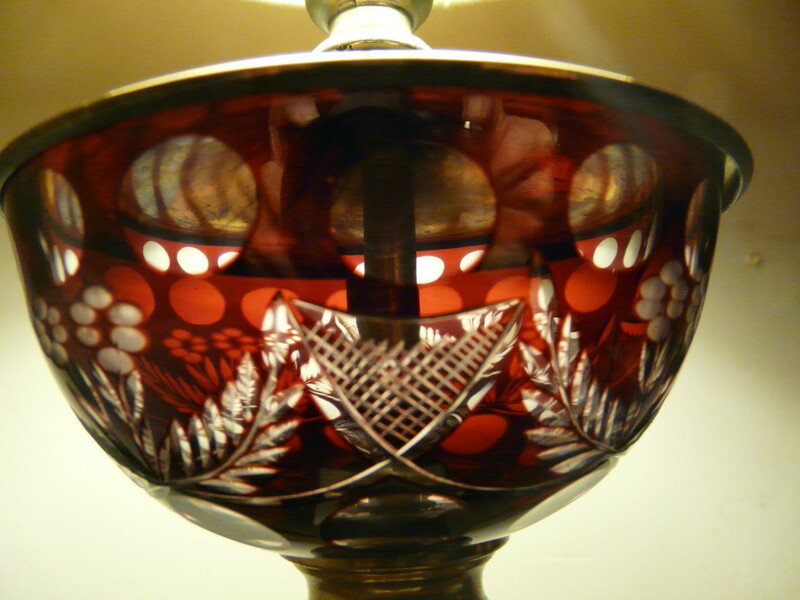 The stained, pattern glass was often further decorated by etching patterns, like flowers, or ivy, into the red stain. I am fortunate enough to have some fine examples of that technique. Although they are two different manufacturing processes, in modern times the terms ruby-flashed and ruby-stained glass are often used interchangeably. I have seen many times in antique stores or on eBay items described as "ruby-flashed glass" or "ruby-flashed cut to clear," when the mold marks can clearly be seen. That makes it obvious that it is actually pressed. It is also easy to tell genuine cut glass by looking at it. The cuts are sharp, in contrast to the more rounded edges of pressed varieties. Most of the red glass you see in antique stores in the US is stained and pressed, like my collection." I call this simply "ruby glass." A lot of the information I am relating here came from the Ruby Stain Museum website. The website is no longer available, which is unfortunate. There was some great information there. The museum itself is located at 2454 Royal Street, New Orleans, LA 70117. The first time I became aware of ruby glass was on a driving trip I took with my husband to New England about 10 years ago. We stopped at quite a few antique stores along the way, and I fell in love with a little souvenir creamer with "Gettysburg" engraved on it. I paid $25 for it, which is really top dollar. 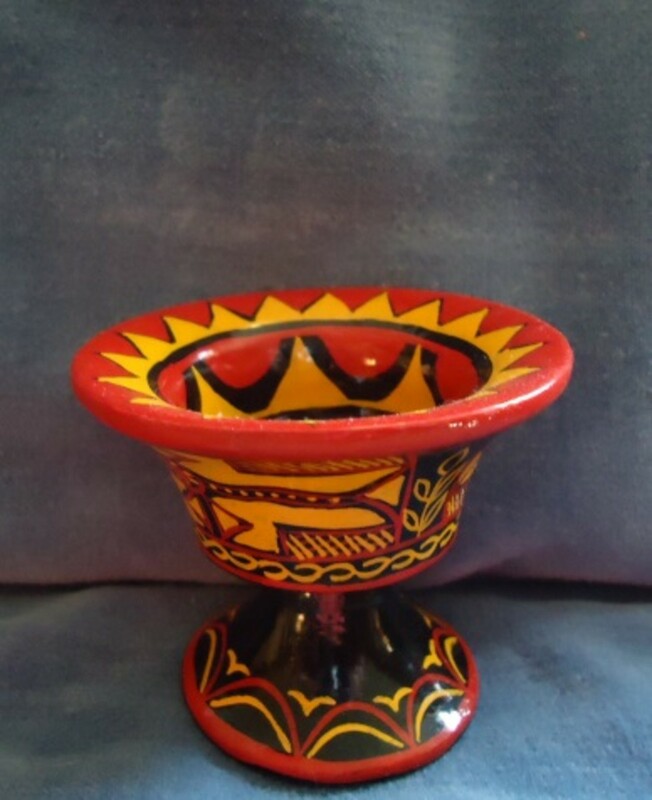 I ended up giving that to my daughter, but because of that experience, when I spotted a beautiful little tumbler at a yard sale near my house, I knew what it was. At $10, it seemed a bargain. That was the first little piece of my collection. I love the deep red color. 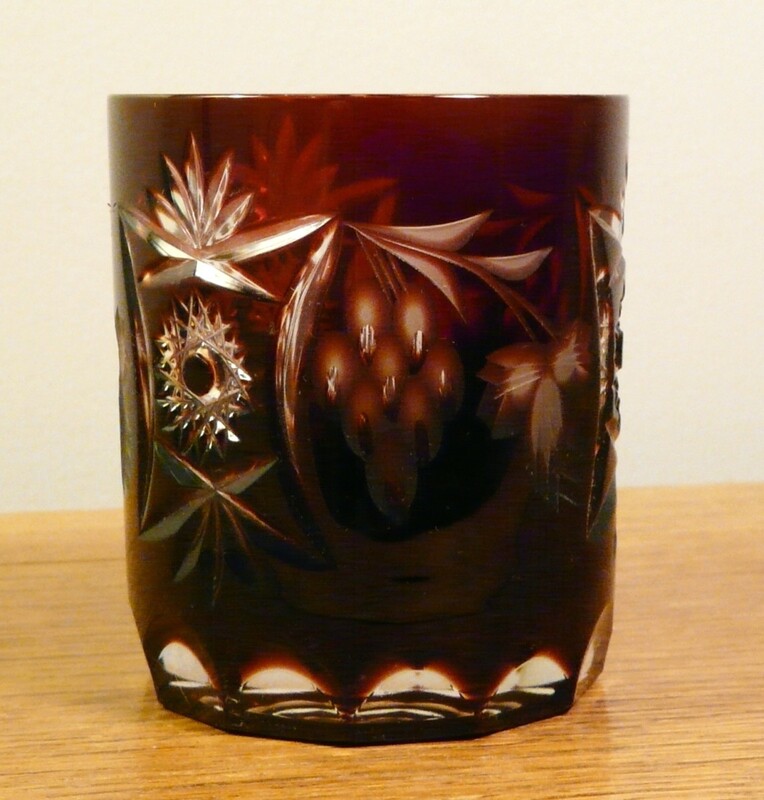 The pattern at the left is pressed into the glass, but the grapes and leaves at center and right are etched into the stain. It's about 3" tall. A nice thing about collecting something is, people see it, and then they know what you like. They will give you more of it on gift giving occasions. Sometimes that backfires, and you find yourself up to your ears in figurines of turtles, or owls, or cows. I never mind receiving ruby glass as a gift. My mom got this delicate looking little basket for my birthday. She bought it at a thrift store in our town. I don't know how much she paid for it, but I'm sure it was a bargain. When I got this piece from a friend, who is a professional junk dealer, it was part of a really ugly lamp. It has a hole in the bottom where the cord passed through. I really wish I had taken a picture of that tacky thing. I looked past the gaudiness and saw how beautiful the glass was. At $20 it was a real steal. I believe it was originally a vase that was turned into a lamp. My friend was very impressed when he saw how spectacular it looks now. 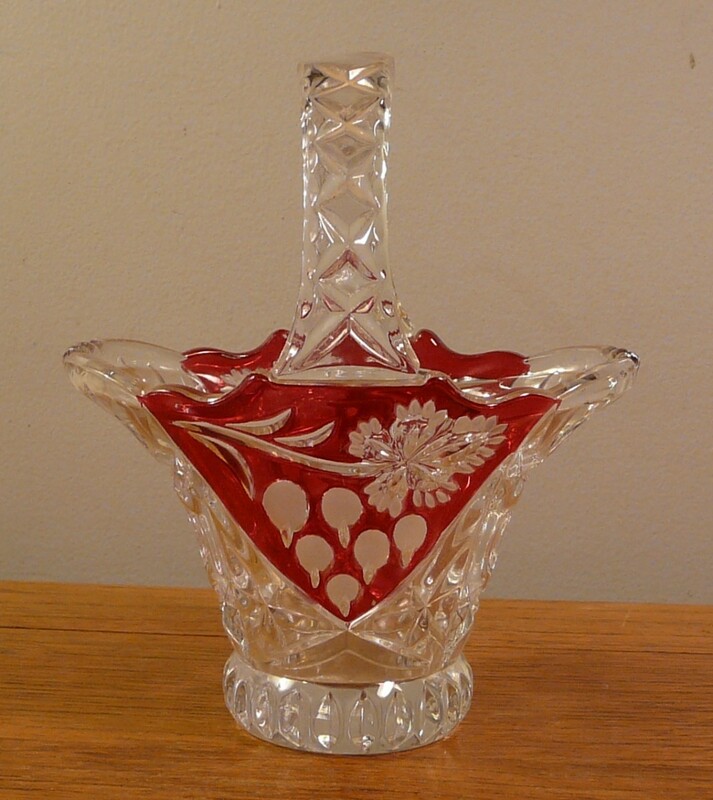 The flower motif is etched into the red stain, while the bordering pattern is pressed into the glass. The vase is about 12" tall. I picked this decanter up in an antique shop in Ft. Lauderdale, Florida. This is the most expensive piece I have; I paid $95 for it. I really do think it is quite breathtaking. I'm afraid my amateur photography does not do it justice. I had to bring it back home with me on the airplane. I wrapped it in bubble wrap, then many layers of clothing and put it in my suitcase, which I checked. I was so relieved to see it all in one piece when I got home. The decanter is about 14" tall including stopper. I received a set of two of these gorgeous lamps as a gift from my husband. They are a rare find. He couldn't resist bragging that he paid only $25 for the pair. 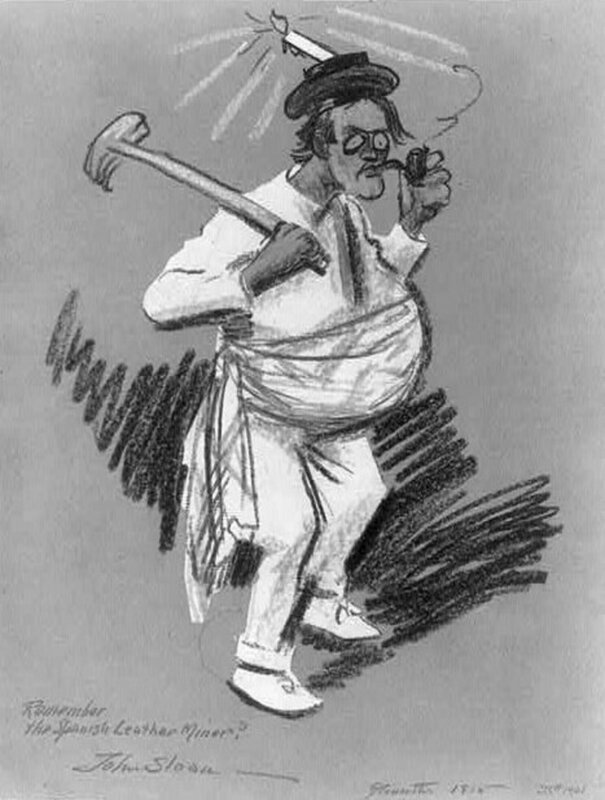 He will often spend more on things for my collection than I will, as I have been known to be a bit of a miser. I think they are very special. Just look at the beautiful details. Now all I need is a fitting set of shades for them. Whether my collection is worth more than I paid for it, or it will be worth more in the future than it is now, I do not know. I collect ruby glass just because I love it. I love the color and the way it sparkles. When I see a beautiful piece, I just can't resist. 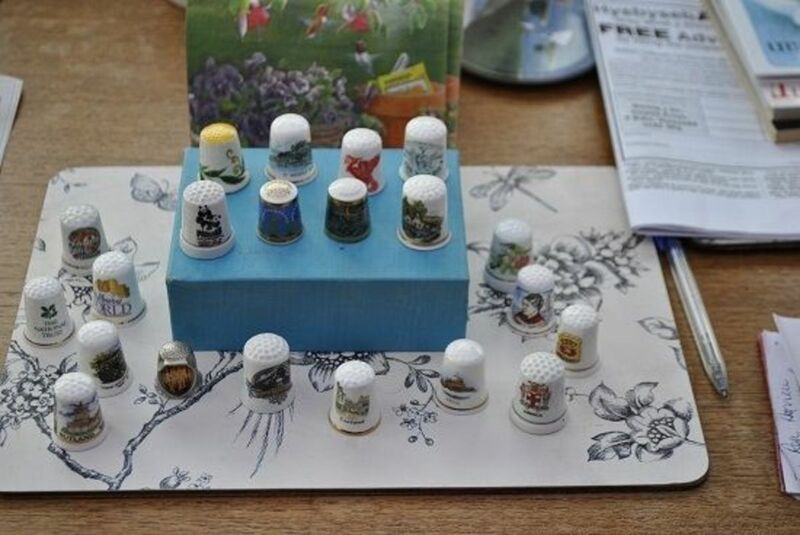 Gorgeous collection - thanks for sharing it. That is beautiful! 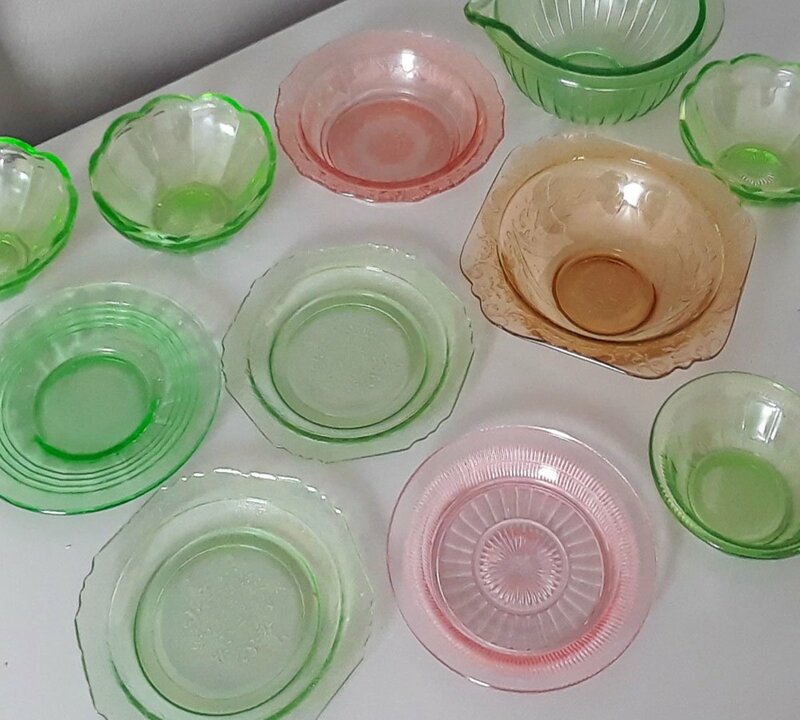 My mother always collected glass like this. She has the ruby glass sets from Avon. Beautiful and inspiring. Great hub! Thanks ishwaryaa22, for your kind comment and vote. I agree that the vase is impressive. It sounds like you have an appreciation for beautiful things. Wow! what a lovely collection you had! You enlightened me on this amazing testimony of ruby glass. 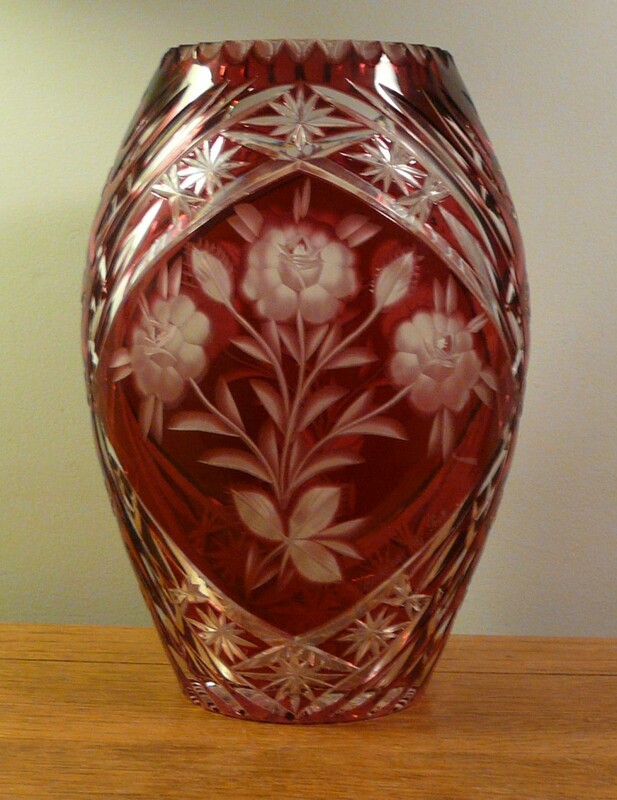 The one I admired the most among your collection is the ruby glass vase with floral motif. 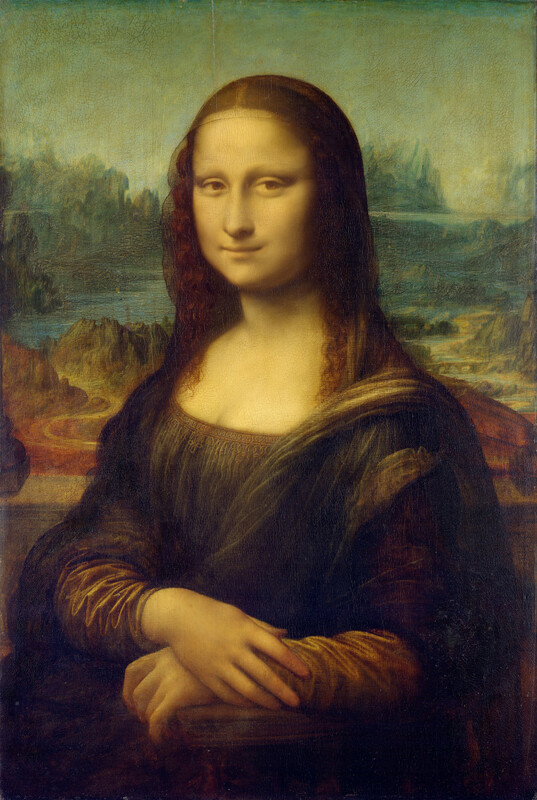 Though I had a collection of antique items and few paintings for my showcase and décor, but this is something which I would like to add to my collection in the future. Thank you for introducing me to this stunning ruby glass. Thanks for SHARING. Beautiful & interesting. Voted up. Thank you tirelesstraveler. Cranberry does look similar,though lighter in color. Thanks for your comment Silverlily555, glass is challenging to photograph. it sounds like you have quite a collection. I really don't know much about the pieces I have, I am just learning really. I'm trying to identify the patterns. Ooh, that makes me shudder to think about breaking a piece. Depression Glass.Ruby red is my color. 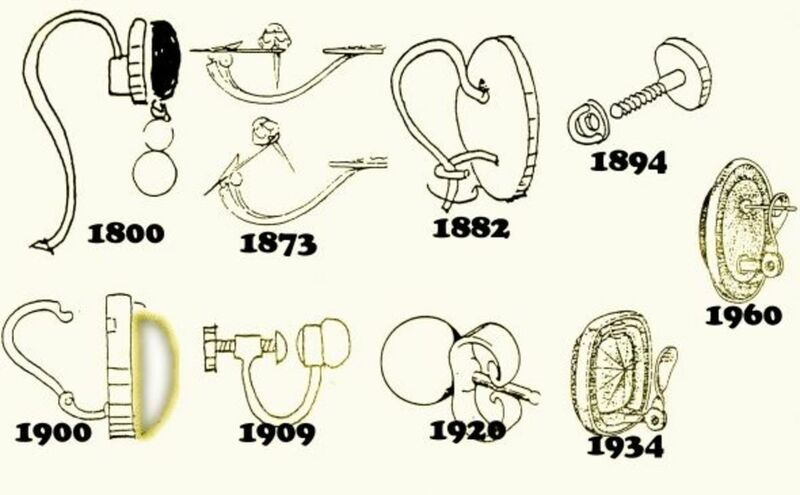 I think I have some pieces made from the original molds created between 1929 - 1932 but sold in the late 50s to mid 60s. I've sold much of my glass collection because I have run out of room. I want to make room to show the best pieces and get them out of boxes. I rarely break a piece. I'm proud of that. Keep collecting. Never hear of Ruby Glass before. 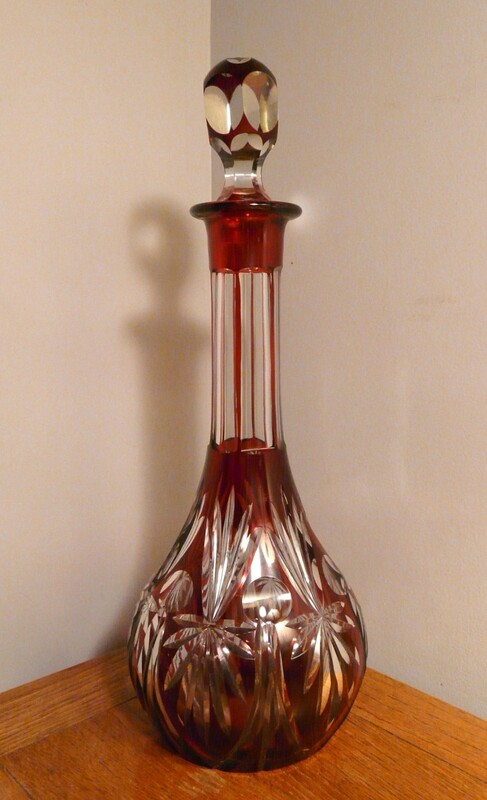 At first glance I thought it was Cranberry Glass. Lovely glassware. Beautiful collection you have. You would never know by looking at it that everything was under $100.